Let’s say you’re a cook, not the world’s best cook but someone who deeply cares and loves cooking. This special type of people who never looks at a watch, who stays late to learn something new and who is thrilled when the reservations for dinner have run out of paper and guests begin piling through the doors. We love them, we look everywhere for them, we care for them like our family and they are among the true heroes of Cuca. We run 2 shifts: an AM and a PM team. Each shift is 7 hours work with 1 hour break. We don’t want zombies walking around doing nothing, we want ninjas with lots going on. This is the story of how an average day goes by if you are one of these wonderful souls. Kitchen doors open and the game begins. Hood fans, ovens and stoves are turned on, stations are set with cutting boards and knives, pots and pans are gathered for cooking, piles of raw ingredients migrate from the fridges to start the day’s preparations. 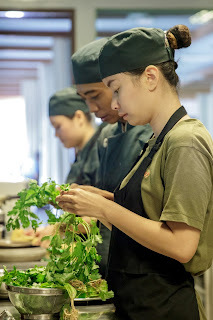 All cooks now race against the clock to complete the long list of tasks making absolutely everything from scratch within the next 3 action packed hours. Daily deliveries arrive: beautiful healthy looking vegetables, ripe strawberries still warm from being cut in the early morning sun, bright orange organic pumpkin, fresh soft cheese and shiny fish chilling out under small cubes of ice. Each item must be checked by the expert in its area and either rejected for any imperfection or stored in the fridge waiting processing. Items arriving late create nervous tension as lunch is fast approaching. Station fridges are bulging with shimmering metal inserts containing perfectly cut, blanched, roasted, marinated or braised ingredients all nicely wrapped and labeled, ready in neat little rows like soldiers waiting to be deployed. The kitchen gets a good clean and staff by now rightfully feel hungry and take a short break to eat. The entire team as a family enjoys an early lunch. They have one hour to eat and catch up on today’s and yesterday’s gossip. Socializing is a very important part of a Balinese life and seeing their huge beautiful smiles and hearing their witty comments, it is easy to understand why everyone loves Bali. 11:59… back to work! Lunch service begins and guests trickle in from the hot sun to enjoy a cold drink and a light lunch. The team is separated with half the crew continuing to prepare for dinner and the other half to produce the food now needed for the first customers. We clean more than we cook and regardless of how busy the restaurant is, everything must always be impeccable. We preach these basics non-stop and they are our foundation for everything else to be learned in Cuca. The PM staff starts to arrive in batches like bees to a hive. They all travel like Motor GP riders through the densely populated and humid streets of Bali. When they get to Cuca they sit outside, have a coffee and get ready to rock. At 3:50 they refresh themselves, quickly change into their uniforms and stand in the kitchen ready for battle at 3:55. A very important time, time for the daily briefing, which is a must for both AM and PM teams. The chef reviews the number of reservations for that evening service and addresses all issues (big or small) from the day before re-instructing the entire team on how to do a better job at almost everything. Briefings are relaxed and casual with jokes, smiles and lots of banter. But make no mistake, the message is crystal clear: we must all do our best each and every day. Kitchen preparation counters are quickly transformed into improvised dining tables and all staff sit down for dinner: either mom’s cooking nicely packed or rice, meat and veggies well spiced with chili bought from a road side “warung” on their way to work. Fuel for the fight ahead. Staff return from dinner and the evening service slowly begins as early tables arrive. The team quickly rushes to finish last minute preparations under the watchful eye of senior kitchen management ensuring all details are ready and precise. Over the next 3 hours, dinner service is full on. Each staff is trying desperately to keep up with making damn near perfect food while keeping track of all the different items they have on order. Cooking, plating and running as fast as possible without making the punishable sacrifice on quality. There is nothing that matters about the outside world: girlfriends disappear, aches and pains are gone, SMS don’t matter as the most important animal instinct of survival kicks in and everyone tries to make it through! Exhaustion. Beginning to break down and deep clean every square inch of the shining stainless steel open kitchen. By now you are either a hero or a villain, a champion or merely a participant. Service determines who you are, it is without words the clearest example of can or cannot. 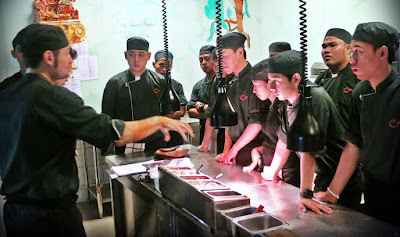 Good cooks will fail as they learn the new skills but pick themselves up for tomorrow in hopes of new found success. Lesser ones just never show up in fear of repeating the traumatic nightmare. 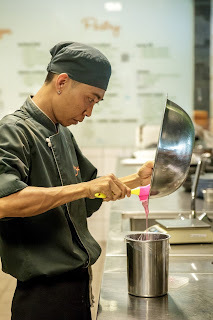 The greatest thrive on the adrenaline rush, the thrill of the action and the incomparable satisfaction of knowing they have provided a truly great meal to our guests. Buying salmon at the super market no matter how fresh feels a bit like cheating. You lose the connection with the ocean, the smell of the sea and the respect for the beautiful animals beneath. There is something magical about fishing or the next best thing, waiting at the dock in hopes the small boats of skilled local fishermen had better luck than you and actually caught you dinner. On a fine late afternoon, Captain Tasty was happy to see his first customers and a little shocked as normally he sells wholesale and it is apparently not normal to stalk fishermen at the docks. Luckily for us, he had fish and what absolutely beautiful fish they were… We bought a salmon and ran home happy. Cutting the fish in half and keeping the skin on, I rubbed the meat gently with a thin layer of apricot jam we got at the farmers market, cracked pepper, sea salt and citrus zest. After 2 hours in the chiller to allow the goodness to soak in, we fired up the BBQ, soaked some wood chips and basically built a hot smoker. Put the fish in and 90 minutes later, low and lovely, I removed a just cooked, light caramel colored smoky fish candy. Try to buy that at the supermarket. 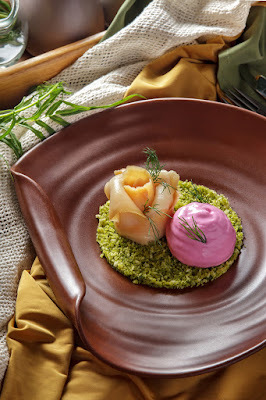 Now you may not have access to Captain Tasty, salmon, a BBQ or even Canada for that matter, but we assure you that making a reservation is very easy and Cuca serves one hell of a cold smoked butterfish from the tropical waters of Bali with whipped yogurt, zucchini pickles and garlic parsley crumbs.